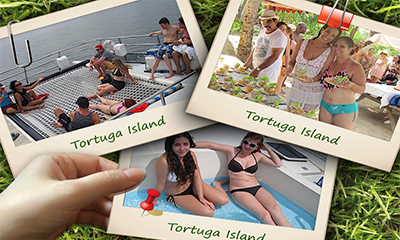 The Tortuga Island tour is done on a luxury catamaran. On the way, our crew will provide tropical fruits and natural drinks while enjoying the blue sea and islands in the Gulf of Nicoya, live music and professional entertainment. After a 1½ hour drive from San José to the dock in Puntarenas and a pit stop for a delicious breakfast, you will board the 71-foot Catamaran Manta Raya for an unforgettable trip. Tortuga is an island paradise with white sand beaches, coconut palms and a beautiful clear blue ocean, all located in the Golf of Nicoya on the Central Pacific Coast of Costa Rica. In route to Tortuga, as you cruise along the calm waters of the Gulf of Nicoya there is always a possibility of spotting dolphins, sea turtles and aquatic birds. Once at the island you can bask in the white sand beaches, take a swim in the blue ocean, walk on the adventurous trails or take an optional tour before enjoying your lunch served with chilled white wine and live music. The Manta Raya has an expansive deck area where you can talk with friends or make new friends, as well as fresh water showers and a bow ramp allowing an easy disembarkation directly onto the beach. In the afternoon, after Calypso’s guaranteed 5 hours at Tortuga Island, your Captain will take you to see many of the protected islands in the Gulf of Nicoya: Cedros Island, Jesusita Island, the bird sanctuary of Guayabo Island, Sugarloaf Island, Gypsy Island and the now closed maximum security prison of San Lucas Island, on the return trip to Puntarenas. Then we will drive back to San José.